Wear a piece of Ireland with this beautifully handcrafted Ladies 100% Irish Merino Wool Cable Crew Sweater with Pockets by West End Knitwear. This stylish aran sweater is made using traditional Irish Aran stitching throughout and has a 2 pockets to the front. 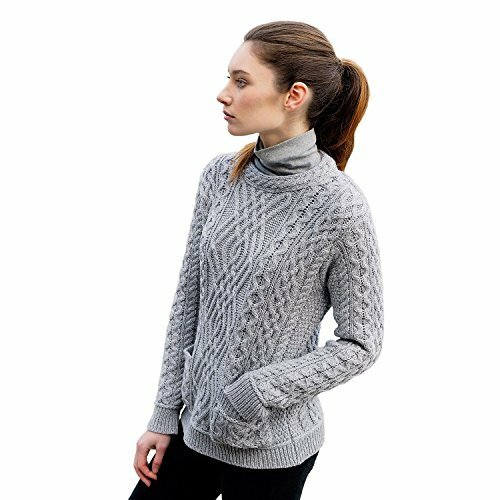 This Aran Sweater is made from 100% soft Irish Merino wool which offers Outstanding Quality & Design making it an ideal warm and cozy sweater for cold weather, the perfect addition to any wardrobe. Available in a selection of colors and sizes. West End Knitwear was originally established by Molly Cullen in 1957, the granddaughter of Kate O'Shea, who, in 1856, was the first craftswoman in Ireland to commercially market her robust, hand knitted woollens. Molly's sons John and Paul along with her grandson Niall are the present owners of the company. Located in the village of Monasterevin in County Kildare, today, it is the biggest knitwear manufacturer in Ireland, it's a modern company with a young, energetic workforce. They are the largest Aran sweater and jacket producer in the world. West End Knitwear is conscious of its roots in the past; however, the company has its eyes firmly focused on the future. Wear a piece of Ireland with this beautifully handcrafted Ladies 100% Irish Merino Wool Cable Crew Sweater with Pockets. This stylish aran sweater is made using traditional Irish Aran stitching throughout and has a 2 pockets to the front. This Aran Sweater is made from 100% soft Irish Merino wool which offers Outstanding Quality & Design, available in a selection of colors and sizes, the perfect addition to any wardrobe.